The current electoral cycle will end in 2019 – presidential and parliamentary elections – but today this period can be defined as the final failure of the current Ukrainian economic model. Certainly, the outgoing authorities will use other words: the economic recovery and successful reforms are already being talked about. But people know a real assessment of these words. In 2017, 71% of citizens called themselves as poor, and 28.5% of citizens don’t consider themselves to be poor, while they do not consider themselves to be middle class. More recent data are not yet available, but only 10% of citizens expected improvements in 2018-2019. Therefore, in Ukraine, the overwhelming majority of people do not feel themselves to be even minimally secured. Such self-evaluations are expected: the authorities have set a living wage, which is impossible to live today. So, from July 1, the total size of the budget in the budget-2018 was UAH 1777 per person, whereas in June, its actual size was UAH 3818. The difference between the first figure and the second – this is what is lacking to millions of our fellow citizens. As a result, in recent years the share of those families whose incomes and expenditures are lower than the actual subsistence level has significantly increased – and this is one of the main indicators of poverty. 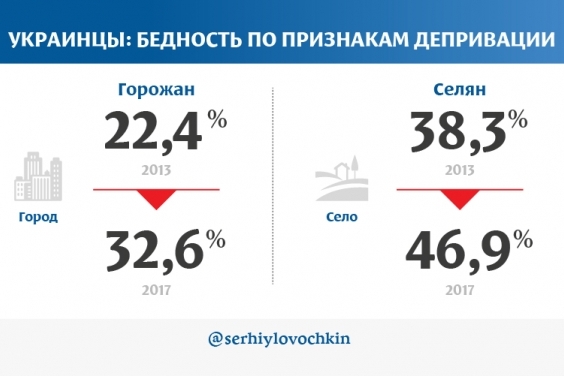 So, according to the latest available data of the Ministry of Social Policy, according to the results of 9 months of 2017, 38.2% of citizens had incomes below the actual subsistence minimum, and 49.8% - expenses. For comparison: in 2014, when the current authorities received the powers, the share of the population with expenditures below the actual subsistence level was almost two times less (28.6%). In 2017, the highest level of poverty in the last decade was recorded in terms of deprivation indicators – deprivation of the ability to consume certain goods and services, which are necessary to provide not only minimal physiological needs, but also a minimum level of comfort and personal development. Nearly every third household (32.6%) considers itself to be poor in terms of deprivation in 2017, and in rural areas almost every second (46.9%) – this is the maximum for the last 10 years. The best indicators for these poverty indicators were achieved in 2013: 22.4% and 38.3% respectively. International financial organizations also declare the same tendencies of impoverishment of Ukrainian citizens. So, according to estimates of the Kyiv office of the World Bank, over the past five years the number of critically poor Ukrainians has increased from 15 to 25%. Over the past five years, the world has made enormous strides forward, and the Ukrainian authorities even cannot achieve the level of 2013. The current authorities are immersed in internecine wars, corruption and unprofessionalism. The current electoral cycle must become the last “five-year period of poverty” in our country. The trend of impoverishment of people must be overcome. The Opposition Bloc offers another agenda both for the parliament and government, as well as the economy of Ukraine. Stopping the war and overcoming the split in society, it is necessary to focus on reforming the economy. The main criterion of effectiveness should be a fundamental improvement in the standard of living of the Ukrainians. Only the restoration and subsequent development of the economy, the change in the current economic model will allow Ukrainians to live with dignity.